ED Carmen Zubiaga met Canadian PM Trudeau. The NCDA Officer-in-Charge, Ms. Carmen R. Zubiaga, discussed the benefits of accessible e-jeepney on the lives of Filipinos with Disabilities with DOTr Secretary Arturo Tugade and Canadian Prime Minister Justin Trudeau during the soft-launching of the Accessible E-Jeepney at the Manila Peninsula Hotel in Makati City on November 13, 2017. 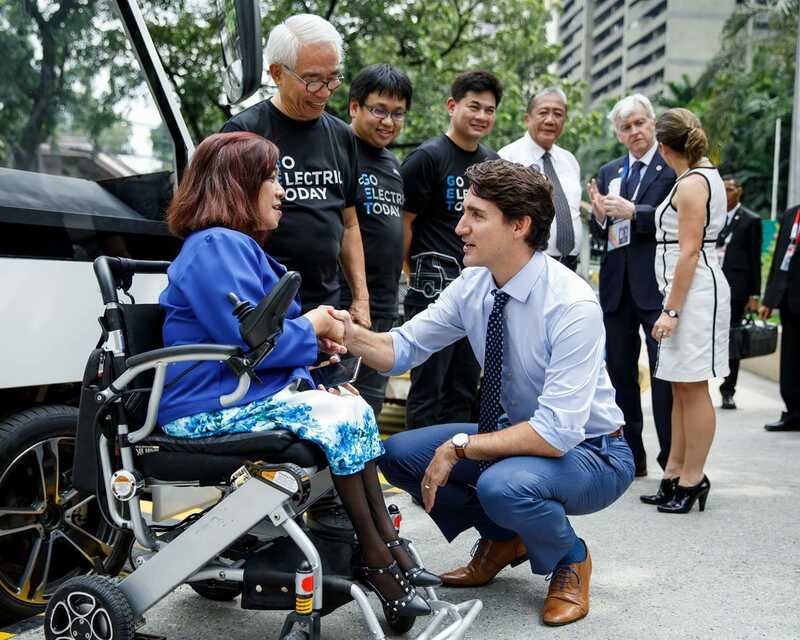 This event was held during the sneak preview of COMET accessible e-jeepney designed by Canadian Engineers. Selected officials and staff from NCDA also participated in the 31st ASEAN Summit and Related Summits’ Opening Ceremony held on November 13 at the Cultural Center of the Philippines (CCP) and Closing Ceremony on November 14 at the Philippine International Convention Center (PICC). by OIC Zubiaga and Deputy Executive Director Mateo A. Lee, Jr. also met casually Philippine National Police (PNP) Director General Ronald “Bato” dela Rosa; Senator Richard J. Gordon; National Youth Commission Chairperson Aiza Seguerra; and Film Development Council of the Philippines (FDCP) Chairperson/Undersecretary Mar Liza D. Seguerra and introduced programs and concerns of persons with disabilities which are worth pursuing through collaborative efforts.